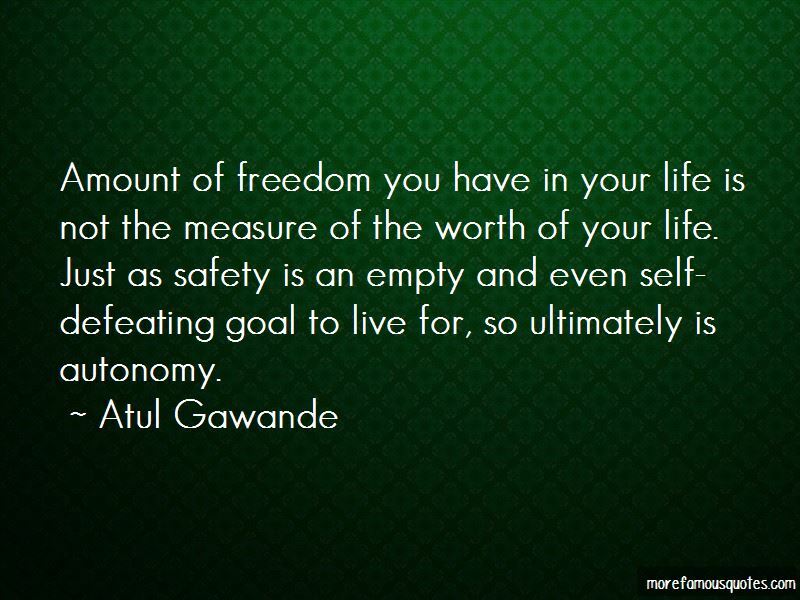 Enjoy the top 241 famous quotes, sayings and quotations by Atul Gawande. We always hope for the easy fix: the one simple change that will erase a problem in a stroke. But few things in life work this way. Instead, success requires making a hundred small steps go right - one after the other, no slipups, no goofs, everyone pitching in. Life is choices, and they are relentless. No sooner have you made one choice than another is upon you. The important question isn't how to keep bad physicians from harming patient; it's how to keep good physicians from harming patients. Medical malpractice suits are a remarkably ineffective remedy. (In reference to a Harvard Medical Practice Study) ... fewer than 2 percent of the patients who had received substandard care ever filed suit. Conversely, only a small minority among patients who did sue had in fact been victims of negligent care. And a patient's likelihood of winning a suit depended primarily on how poor his or her outcome was, regardless of whether that outcome was caused by disease or unavoidable risks of care. The deeper problem with medical malpractice is that by demonizing errors they prevent doctors from acknowledging & discussing them publicly. The tort system makes adversaries of patient & physician, and pushes each other to offer a heavily slanted version of events. The core predicament of medicine - the thing that makes being a patient so wrenching, being a doctor so difficult, and being a part of society that pays the bills they run up so vexing - is uncertainty. With all that we know nowadays about people and diseases and how to diagnose and treat them, it can be hard to see this, hard to grasp how deeply uncertainty runs. As a doctor, you come to find, however, that the struggle in caring for people is more often with what you do not know than what you do. Medicine's ground state is uncertainty. 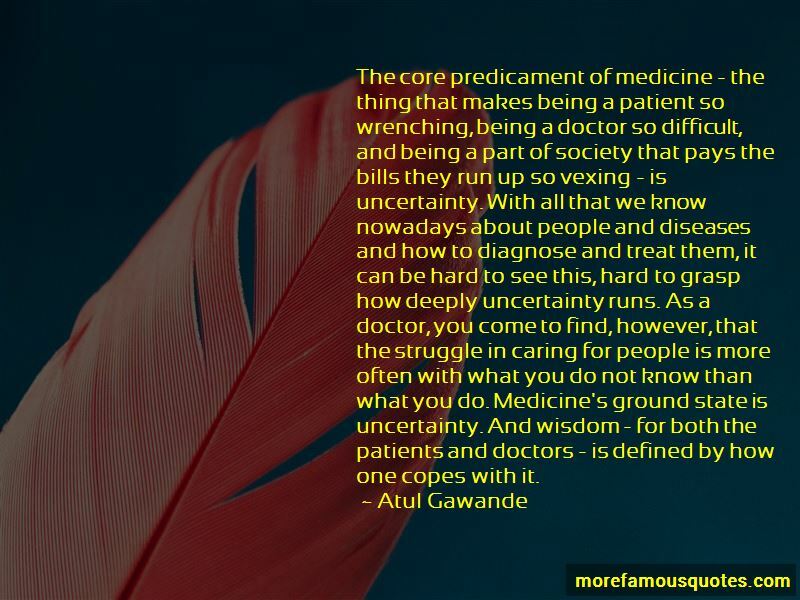 And wisdom - for both the patients and doctors - is defined by how one copes with it. Terminally ill cancer patients who were put on a mechanical ventilator, given electrical defibrillation or chest compressions, or admitted, near death, to intensive care had a substantially worse quality of life in their last week than those who received no such interventions. And, six months after their death, their caregivers were three times as likely to suffer major depression. We want progress in medicine to be clear and unequivocal, but of course it rarely is. Every new treatment has gaping unknowns - for both patients and society - and it can be hard to decide what do do about them. People die only once. They have no experience to draw on. You know, there's this phase of people's lives in which they can't really cope on their own, and we ought to find a way to make it manageable. HOW DID WE wind up in a world where the only choices for the very old seem to be either going down with the volcano or yielding all control over our lives? Doctors quickly learn that how much they make has little to do with how good they are. It largely depends on how they handle the business side of their practice. The evidence is that people who enter hospice don't have shorter lives. In many cases they are longer. If we took away the ability to put defibrillators in people in their last years, people would be shouting in the streets. 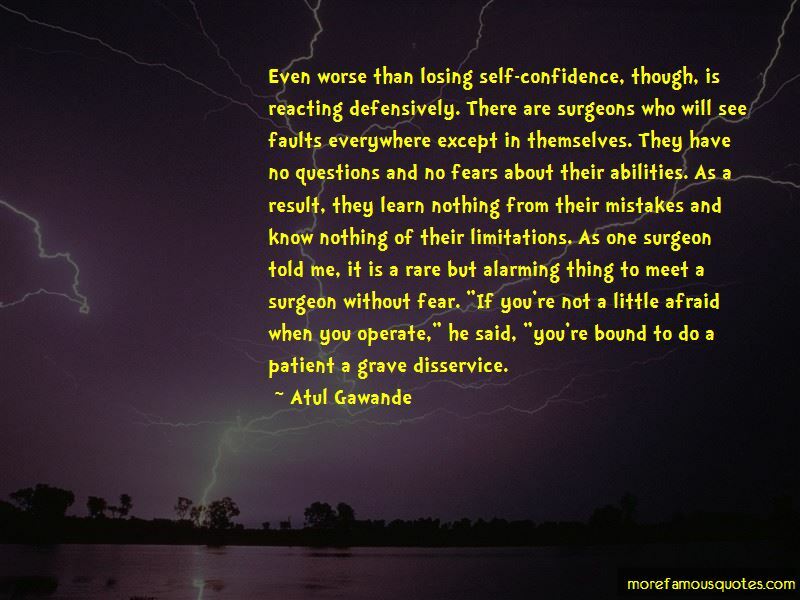 Want to see more pictures of Atul Gawande quotes? 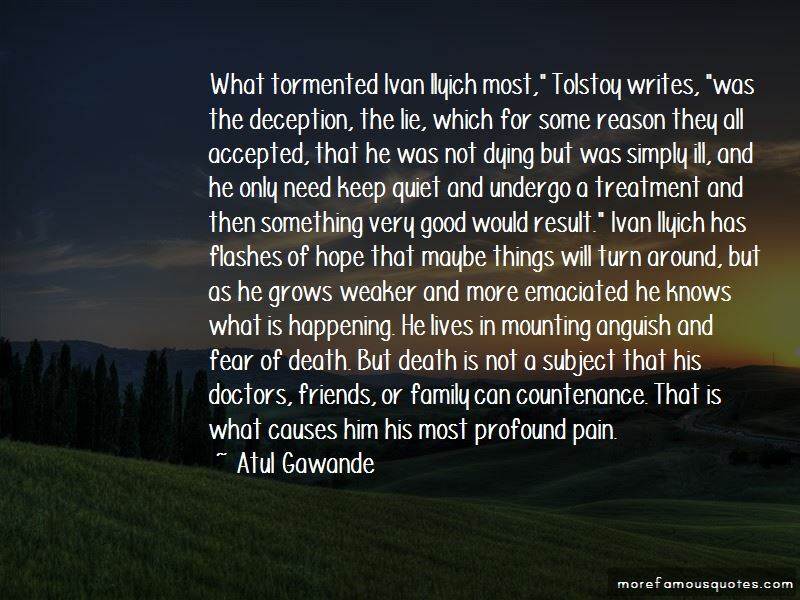 Click on image of Atul Gawande quotes to view full size.